“By mid-21st century, a team of fully autonomous humanoid robot soccer players shall win the soccer game, complying with the official rule of the FIFA, against the winner of the most recent World Cup”. This is the official goal that the organizers of the international “RoboCup” competition have set for themselves. It may seem a little over-ambitious to some, but the “RoboCup” Annual Challenge, first held in 1997, has shown great developments in the field of robotics and the technology used over the years. In the most recent 11th “RoboCup” tournament, held at the Georgia Institute of Technology in Atlanta, attendees witnessed a competition between microscopic robots that competed within the “Nanogram League”. The designed micro robots ranged from 100 to 300 micrometers in size, and therefore the match could only be seen through a magnified broadcast shown on large screens at the event. Two of the participating teams in this challenge came from Carnegie Mellon University. One was led by Electrical Engineering and Robotics Professor Gary Fedder and the other by Mettin Sitti, Assistant Professor of Mechanical Engineering and Robotics. The teams used different techniques to approach the problem and presented robots powered by electrostatic or electromagnetic field actuation. The “Nanogram League” is hosted by the National Institute of Standards and Technology (NIST), which hopes to show the advantages and the potential of building and applying very small devices in manufacturing, biotechnology and other industries. At the center of the competition, the 34 participating teams, who arrived at Georgia Tech from all around the world, competed in one of the four leagues: the four-legged AIBO league – 1st place taken by the “Northern Bites” from Bowdoin College, USA, the small and mid-sized robot leagues – 1st places taken by “CMDragons’07” from Carnegie Mellon University and “Brainstormers Tribots” fromUniversity of Osnabruek, Germany, (including the “Nanogram League”, in which the winners were “ETH” from Zurich) and the robot rescue league (1st place taken by “INDEPENDENT” – a team from King Mongkut’s Institute of Technology in North Bangkok, Thailand). 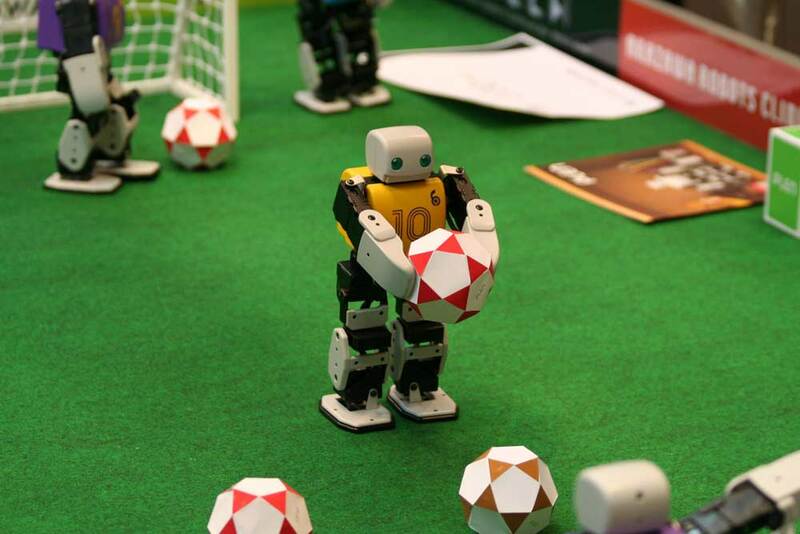 In addition, robots were tested on their performances in various sport simulations, like one in which they faced a goal guarded by a human player, and the task was to score as many soccer goals as possible. The organizers of the RoboCup expect that innovative technologies will emerge from this competition, and the most outstanding robots built will be used in practice in different fields. One of the focuses of RoboCup is the developing of robots to be used in search and rescue missions. These robots may save lives in cases where humans are unable to enter because of a dangerous environment. RoboCup is an international research and education initiative. In 1993 the concept of soccer-playing robots was first looked at, and after 2 years of feasibility study the conference and games were announced. In July 1997 the first official games were held in Nagoya, Japan. Since then, the annual games were hosted by different countries around the world including France (1998), Australia (2000), Germany (2006), and others. More details RoboCup 2007 can be found on the tournament’s website.